At the 1970 NABBA Mr. Universe a still young and sensational Arnold Schwarzenegger wins his final NABBA crown in England, taking out the Pro class. At the 1971 NABBA Mr. Universe contest, the Overall Amateur winner was Ken Waller and the Overall Professional winner was Bill Pearl. Part 1. At the 1970 NABBA Mr. Universe a still young and sensational Arnold Schwarzenegger wins his final NABBA crown in England, taking out the Pro class. A very historic record of the highlights from this famous event. You’ll also see the amazing Frank Zane (Overall Amateur Mr. Universe), Franco Columbu, Frank Colombera, Johnny Fuller, Chris Dickerson, Boyer Coe, Dave Draper, Reg Park, Al Beckles, John Citrone, Walter O’Malley, Helmut Riedmeier, Brian Eastman, Frank Richard and more. This was the first international contest shot by Wayne Gallasch. Part 1 runs for 22 mins. 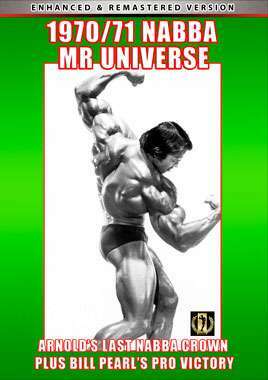 Part 2 of this DVD is the 1971 NABBA Mr. Universe contest. The Overall Amateur winner was Ken Waller and the Overall Professional winner was Bill Pearl. Also includes Frank Zane, Reg Park, Kassem Yazbek and the great Sergio Oliva. Frank Zane was the Pro Short Class winner in 1971. Other top Amateurs shown include Ken Waller, Chris Dickerson, Elias Petsas, Frank Colombera, Chuck Collras, John Holt, Jack Chenier, Michael Baker, Ehrling Wahlgren, Roy Perrot, Lars Lunde, Warren Frederick, Al Beckles, Roy Callender, Pete Caputo and Paul Grant. Part 2 runs for 57 mins. Special note: Please bear with us on this great classic. It was shot under very difficult conditions. The lighting at the prejudging was average, and given the technology of the day the quality is the best we can achieve using modern technology to enhance the colour and total picture image. Shot on film, digitally transferred to video, then to DVD and music added. In celebration of the 60th year of the NABBA universe in 2008, this whole DVD production process was re-done on August 27th, 2008 to REMASTER & EXTEND this DVD from 60 to 79 minutes. Most photos were taken by the late great George Greenwood, who authorised their use by Wayne Gallasch. Also thanks to Malcolm Whyatt. The Prejudging was held on Friday, 18th September, 1970 in the Ballroom of the old Royal Hotel in London. The Show was held on Saturday in the Victoria Palace Theatre, London on 19th September, 1970. Arnold Schwarzenegger’s early contest history 1963 – 1966, article also includes competitive weightlifting and powerlifting history 1963 – 1968. Just wanted to say that 1970/71 Universe NABBA DVD was unbelievable!!! !